My first reflection is to simplify this newsletter, for this month at least. So for May, there is just this article. Plus a link at the bottom to find out more about workshops etc and to meet up (in person or online) for a cuppa and a chat. If you are reading this, you have already found your way to my website, in order to help subscribers find their way around I have recorded a short video. If you would like to see that too, here is the link to my YouTube channel. You will probably laugh at me as I sneezed energetically in the middle. Maybe I will record a new version but not today. If you prefer the other format with all the information in detail within the newsletter do let me know, and any other feedback and suggestions are always very welcome. Just reply to this email and I will be delighted to hear from you. I know that many of you who read this prefer not to be on Facebook, for those who are, you can always link up through that medium also and you will find a lively community developing in the 'Dare to Blossom into Joy' group where I share a card of the day and some photos. And so, back to Laughter - such a big part of my life, and my work. This was the theme of the last workshop here in Cornwall, and we will be exploring 'Purpose' in the April Dare to Blossom into Joy Mastermind group, just about to begin on April 2nd (more about that below, and there is still time to join us if you wish). So, 'Purpose', what does that word, that concept mean to you? What is your first response to the word? This month I have left writing this until the very last minute, so, although I should get this out on 28th February, by the time you read this it may already be March. Here in the UK, even in normally mild Cornwall, we are just entering a very cold spell. This often happens in March, though not for a few years now. Some years back it was below freezing for about ten days. The fountain in our pond, which we left on to aerate the water for the fish, created an amazing ice sculpture as the water gushing from the top froze around it and a frozen cascade grew and grew. It must have been a while ago as it was before I had a digital camera, so I have no photos at hand to show you. The subject for these reflections - growth - will, I hope, be a chance to reflect on green shoots, rather than ice accumulating. It is also the theme for the last week of the 'Peace' Mastermind group (in the Stepping into Your Power programme) that has been running through the month of February. This has been the first of five in-depth months as we journey through the year together. In April we unfurl the 'Purpose' petal together. The chance for you to apply to join the Mastermind group will be opening soon, just as soon, in fact, as I can get the information ready. February has been a wonderfully busy month, culminating in a trip to Surrey to exhibit at the Holistic and Mystic Show at Dorking. I was also invited to be a speaker on the talks programme there, and I was delighted to share a little of the Dare to Blossom story with those who joined me, along with offering each person their own Rediscovery Card to take away with them. For those of you not able to visit, here is the interview I did for their blog. 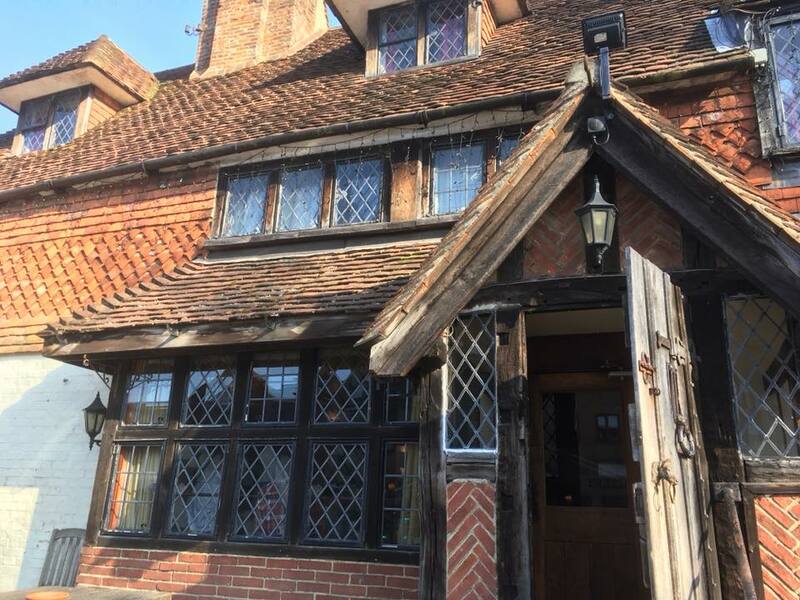 I was lucky enough to be taken to some scenic spots - we had lunch in the village of Forest Row, I loved this building - it was actually a pizza restaurant, but I think I managed to get a shot without any signs to distract you from the beautiful architecture. Today, as I write a week before you will receive this, I was able to get out for a walk for the first time for a while. The weather has been - well, what you would expect in a Cornish winter - wet, drizzly, windy, with hardly any sunshine. Today the forecast was at least dry, and I wanted some time out in nature to reflect, to begin this piece for you. I chose the title 'Peace' as it fits with where I am in my cycle of the year. Last Saturday was the first workshop of the six planned for this year at the Blue Lotus Therapy Centre. A beautiful morning spent together exploring Peace. Ending with an unexpected and delightful singsong! 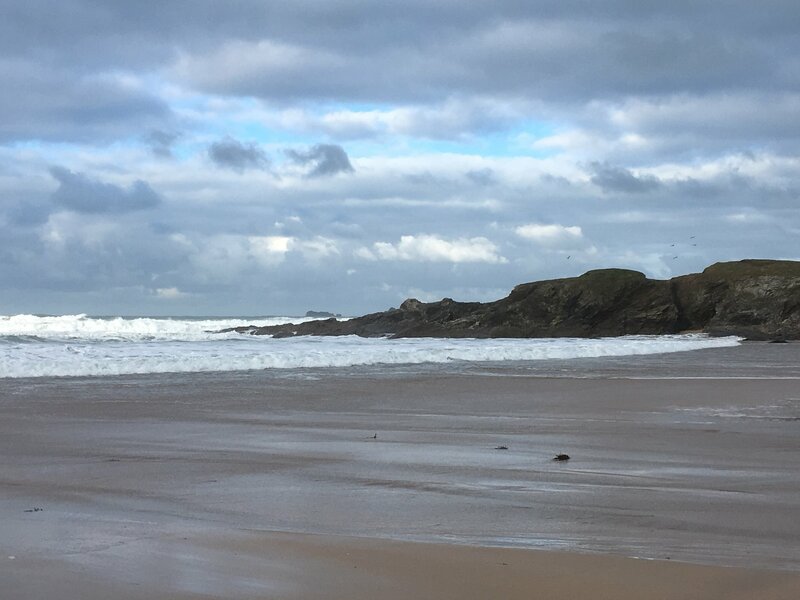 So, a walk to reflect, on this very windy beach, at Constantine Bay, near Padstow and St Merryn, here on the Atlantic coast. This was far from a peaceful experience - the big ocean waves were crashing and the wind was blowing, and it was wonderful. Full of the energy of nature - and that is one place I find my peace, whatever the conditions are at the time. Happy New Year - may 2018 be an amazing year for you. Usually, the 'Reflections' piece here has a title, a subject, a theme. This time it is simply.... reflections. One of the suggested 'words for the year' with the My Word Goddess Reading that I receive from Amy Palko each year is 'Orientation'. I have been trying that on for size and it hasn't quite felt the perfect fit. Then my mind went to 'Flow' and someone in a group I belong to, where we were discussing our words, said this: ""Mary, I have this picture of you swimming in a vast ocean with goggles on and a compass in your hand trying to orient yourself to land." and then asked me if I felt adrift. My reply was, not so much adrift as sitting with the feeling that things are about to become crystal clear next year, and maybe in unexpected ways. So, that is where I am just now. And, then I was drawn to look back on the ten years of writing these newsletters - I began in March 2007. So, my first ever reflections for a New Year were in January 2008. Reading again I see a snapshot of my life then, linking in with my memories of that time. What was happening then? In my business I had workshops planned for 2008 in Cornwall, Covent Garden in London, and in York. 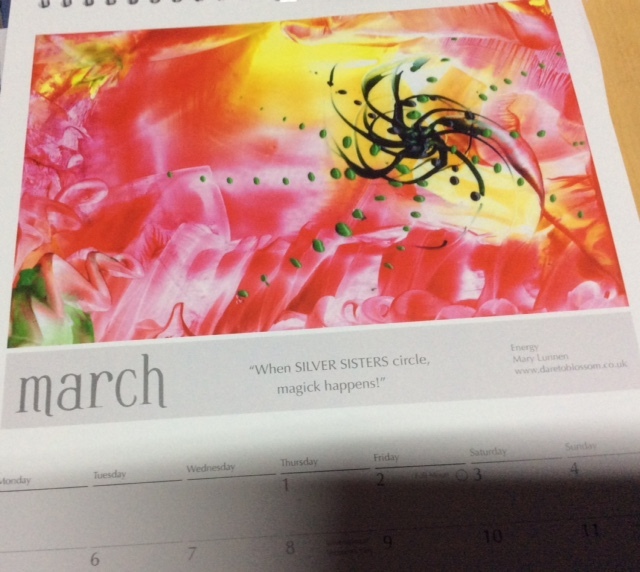 Such an honour to have one of my paintings chosen for the March image in The Silver Tent Calendar 2018. Sales are raising funds for this wonderful community. 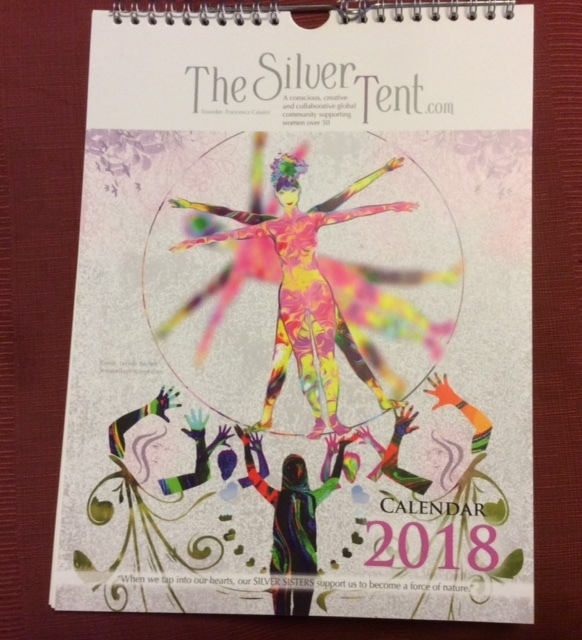 Here is where you can find out more about the Calendar - and buy your own copy before they sell out - and browse the website to find out more about the community.